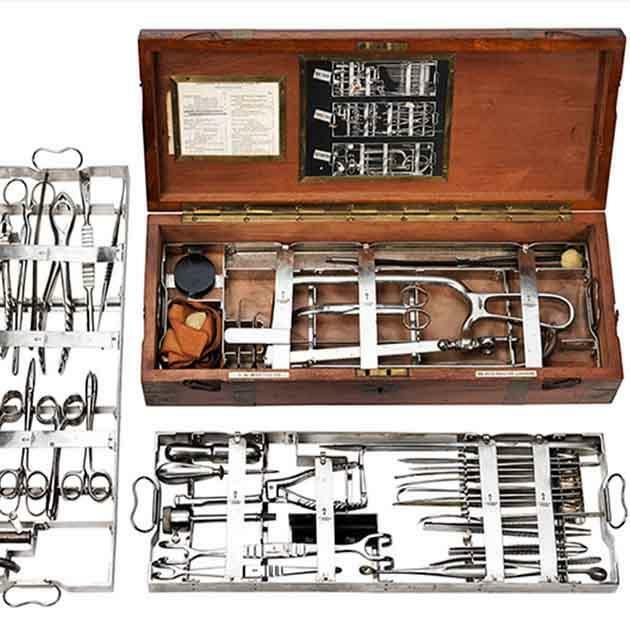 This surgeon's case, in the style of British campaign furniture of the 19th and early 20th centuries, was used in British and Commonwealth Field Ambulance and Casualty Clearing Stations. The letter 'I' on the lid indicates that this set was considered suitable for service in British Imperial India. The trays and instruments are made of stainless steel to allow them to be sterilised in a portable autoclave. Compact and robust, it contains a wide variety of instruments that would equip a surgeon to treat a range of life-threatening battlefield injuries. Made by JH Montague of 69, New Bond Street, London.